Traveling is stressful, especially if you are preparing for a long distance journey for a sick or injured loved one. Being a caregiver can be emotionally and physically draining. At times, if you are local to your loved one, you can meet their needs more quickly; however, if you are not physically close, living in another city or state, can leave one feeling at a loss of how to meet their needs. It is difficult to prepare for the unexpected, fortunately, there are many things that you can do to prepare for a long distance travel to help ease the pains that travel can bring. One of the best things that you can do to prepare for a long-distance travel is to check in with your loved ones on a regular basis. It is great to communicate with your loved one over the phone or using a video chat service, such as Facetime or Skype, is also a great way to stay in touch. If you need to plan a trip with a non-emergency medical transport service, Med Transport Center, offers the ability to check in with your loved one or the licensed nurse throughout the entire transport. The bedside nurse will call regularly during the transport to let you know how they are doing and provide their physical location. They even provide a phone number that allows you to call directly to the nurse during the entire journey. This will help ease your mind that your loved one is in safe hands with two professional drivers and a licensed nurse who are keeping in touch with you throughout your loved one’s travel. Once your loved one is at their destination, you should plan to visit them, if possible, and continue to check in on them on a regular basis. Nothing beats seeing your loved one face to face and spending time with them. However, if you can’t visit them in person, it is important to continue to check in with them. Another way to make sure that your loved one is stable to travel is to check in with his or her healthcare providers. If they are currently in a medical facility, contact the case manager or social worker in the facility to discuss the possible transport and get their opinion. They may want to have the physician to evaluate if travel is appropriate and if so, what type would be best. If you determine that your loved one is stable for non-emergency long distance medical transport by air or ground, Med Transport Center will make the process easier for you by contacting the case manager or social worker at the medical facility and requesting all the needed paperwork and medical records. They will also coordinate with the medical facilities the best times for your loved one to be picked up and to arrive at the new destination. It might also be helpful if your loved one signs a release form stating that it is okay for the doctors or facility staff to discuss his or her health information with you if you need to follow up for any reason. There are many local resources available to help caregivers of aging loved ones. You can do a quick Google search online, contact the nearest hospital or skilled nursing facility, or call 411 for information on local resources that would be best suited for your loved one’s needs. You can help ease the stressful burden of travel by having a plan in place if something unexpected happens with your loved one. It is a good idea to be mindful of everyday life events and who you can trust to step in and take over if needed. Make a list of who you can contact when you are out of town. Write their full names and best contact numbers and place in an easily visible place. Or create a list on your phone so you have them and can quickly make any calls as necessary. Having a strong support system will take a lot of the pressure of worry from you and your loved one. Make sure that your loved one and has a list of people he or she can get in touch with in case of an emergency during the trip as well. You should also prepare to make an emergency trip. Keep a bag packed just in case you have to leave on a short notice. You should also research airline flights and either hire a travel agent or bookmark a secure travel website on your phone. (Such as, Priceline.com, Expedia.com, etc.) Most travel sites, offer the option to check in on your phone within 24 hours and provide an online airline ticket voucher so you do not have to worry about printing out a boarding pass. So if you are a little tech savvy – you can log in from your phone, find your flight, book a flight, and access your boarding pass – all from your phone! It can be a simple arrangement if you feel comfortable doing so on your own. Finally, if you are working, then it would be a good idea to discuss your current loved one’s situation with your boss. You don’t need to go into full details but make sure that you let him or her know that there may be a time when you have to leave on a short notice. It would also be a good idea to discuss with a co-worker, and they may be able to cover your workload when you are gone. Need Help Preparing for Long Distance Travel? 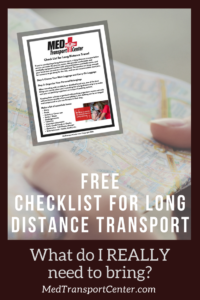 Get your FREE Travel Checklist today! Med Transport Center offers non-emergency long-distance medical transportation by ground (MED Coach) or by flight (MED Flight). Our expert professionals coordinate the trip for your loved one while all you will have to do is call to make arrangements. Our transportation service is designed for anyone who has increased medical needs or limited mobility, including the elderly, disabled, or even those who are just needing a little assistance during their travel. Med Transport Center is dedicated to providing a safe, comfortable journey with each ground or in flight transport. Each ground transport is medically-equipped for non-emergency transports, offers 2 professional drivers, a licensed nurse and offers an emergency physician in case the need arises. Furthermore, our utmost priority is to make sure that your loved one will safely get to his or her destination.